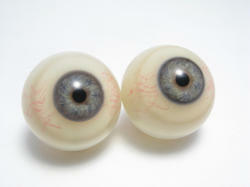 We introduce ourselves as an eminent manufacturer, exporter, importer, trader and supplier of Ocular Iris Button. This iris button is manufactured under the supervision of professionals utilizing finest quality material & contemporary techniques. Our offered iris button is available in colours like black, light brown, dark brown, blue, green, gray. Also, this iris button is checked in terms of quality before dispatching from our end. Single Bar: It is made of transparent acrylic and a scale is engraved on both sides of the bar. The grove of the instruments fit into the outer bony margin of the orbit and it is held in a direction perpendicular to the transverse plane of the orbit and parallel to the visual axis. 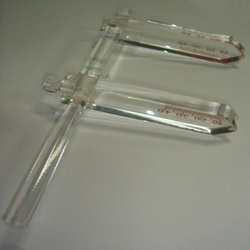 Double Bar: It is made of transparent acrylic and has two bars on the main shaft. A scale is engraved on both the bars on only one side. This is used to measure the depth on the eye socket by fitting both the bars on the bony margin of the orbit and aligning them so as to get a precise measure of the socket. We are passionately engaged in offering an exclusive array of Suction Pumps that enable ease in handling of prosthesis or corneal shields while taking placing or removing them from the patient cavity. This suction pump is manufactured with the use of high quality silicon material and latest technology. Also, we provide this suction pump in numerous sizes and other customized options to fulfill the requirements of customers. The offered suction pump allows effortlessness in handling of prosthesis. 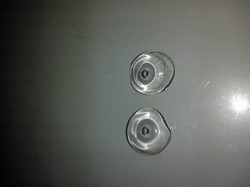 Available Sizes: Right and Left Conformer; 20mm, 22mm, 24mm, 26mm and 28mm. Cosmetic Shell Cosmetic shell is used in case of disfigured eye only if there is no danger to the patient in the retention of the sightless eye. It is extensively used after evisceration. 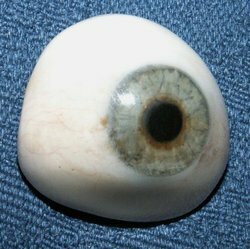 It is made of acrylic and it is lighter and thinner than artificial eye. 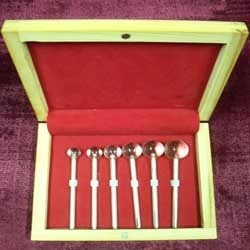 Available Sizes: Universal; 22mm, 24mm, 26mm and 28mm. 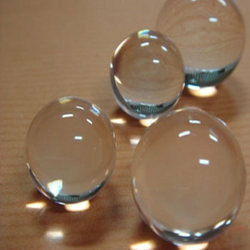 Artificial eyes for Sculptures, Statues made of High Quality Heat Cure Acrylic Powder. Custom made ocular iris , out line present in cornea. Sizes Available— (Left and Right) 16 mm to 30 mm etc. Artificial eyes packing is 50 eyes per box. To maintain shape and the movement of the eyelid and for cosmetic purposes To retain the tone of facial muscles to prevent alterations of features To prevent foreign bodies from entering the ocular cavity To prevent accumulation of fluid in the cavity and to direct secretions to proper channels. 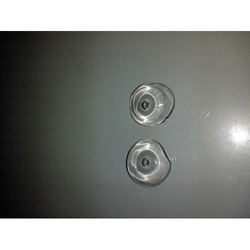 Available Sizes: Right and Left Eye: 16 mm, 20mm, 22mm, 24mm, 26mm and 28mm. 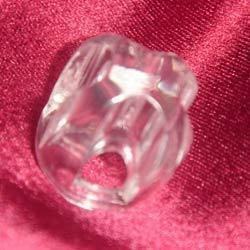 Quality clear corneal buttons made according to your specifications, the pupil as low as possible or without pupil. Spherical Implant is positioned within tenon’s capsule without attachment to the orbital tissue. During the version movements, the fornices of the enucleated socket retracts and lengthens on the side towards the direction of the gaze because contraction of the muscles and Tenon’s layer occur on that side. Available Sizes: 12, 14, 16, 17, 18, 19, 20, 21, 22, 23 & 24 mm. 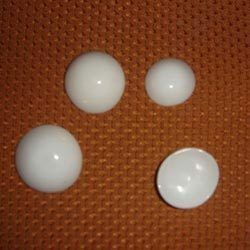 Being one of the reputed organizations in the market, we are engaged in offering an exclusive range of Spherical Implants. The offered product is positioned within tenon’s capsule without attachment to the orbital tissue. 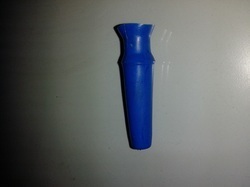 Also, our product prevents cause of pressure necrosis & provides motility to the prosthesis. This product is available with us in diverse sizes and other specifications to meet the specific requirements of customers. Available Sizes: 12, 14, 16, 17, 18, 19, 20, 21, 22, 23 & 24mm. Castroveijo implant imparts motility to the prosthesis by acting as a smooth convex pivotal surface over which the artificial eye or cosmetic shell glides during shortening and lengthening of the fornices. Anteriorly, it has a central depression surrounded by four bridges. The four rectii muscles are accommodated in the tunnels situated directly beneath the bridge and the end of the opposed muscles are sewn so as to overlap each other. The implant is completely buried under the tenon’s capsule. It also serves to prevent bony deformity of the orbital wall. Available Sizes: 13mm, 15mm and 17mm. 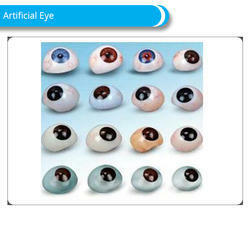 These unmatched quality Artificial Eyes are available in different varieties as per the requirements of our valued customers. 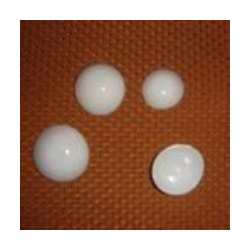 These Artificial Eyes are made of High Quality Heat Cure Acrylic Powder. Custom made ocular iris, out line present in cornea. (Left and Right) 15 mm to 28 mm etc. Black, Dark Brown, Light Brown, Light Blue, Dark Blue, Green, Yellow etc. These are pumps which enable ease in handling of prosthesis or corneal shields while taking placing or removing them from the patient cavity. These are made of silicon material. Looking for Oculoplasty Products ?